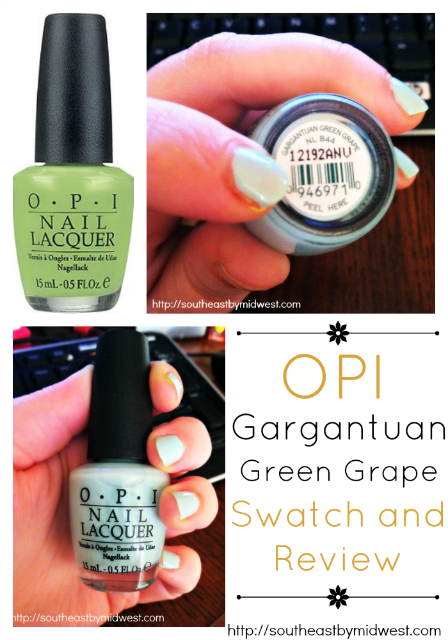 Today I’m reviewing and showing swatches for OPI Gargantuan Green Grape nail polish. I will be judging the polish on Ease of Application, Color, Feel, and Lasting Power. It was pretty easy to apply two coats of this polish. Sometimes with polishes when you go to apply the second coat it go a bit tacky. This polish did not have that problem at all. The polish wasn’t thick, goopey, nor was it super liquidey either. Overall just a regular polish. The color for this polish is a bit odd. There are actually two different versions of this polish a more green version that some say are matte and a bluer version that is glossy. I got the more bluer glossy version, as you can see from the image, which looked gorgeous when dried. However, the first coat of this polish was a bit sheer and took two before it was opaque enough to see it’s full glory. The feel of this polish was supposed to be glossy and it achieved that. It didn’t dry tacky, nor was it super slick. The lasting power of this polish was very good. I didn’t use a top coat over the top and went about a week without chipping. If I had used a top coat I probably could have worn this for about two weeks before seeing chipping. Overall this polish was a good polish. I didn’t use a base coat and it didn’t stain my nails, I didn’t use a top coat and it lasted about a week before chipping, and it only took two coats before it was opaque. However, you do have to be careful with which one you get as I’ve heard that the matte version is not as good. i like it with the greener tint. i wonder why it has 2 diff colors? 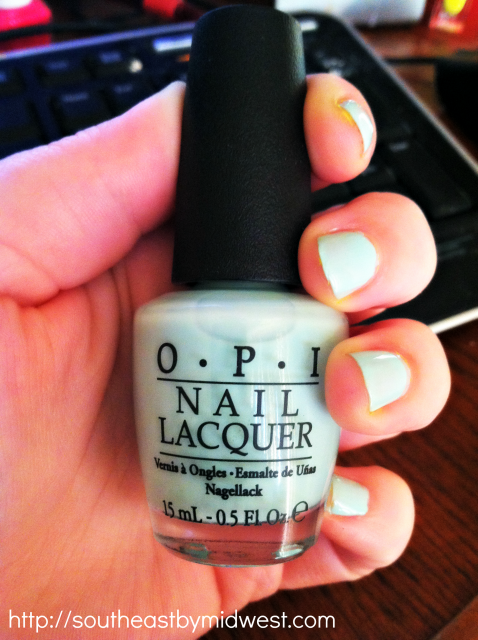 The bottle you have in your hand and the bottle in the OPI picture look so different! It’s so much lighter on your nails! It’s strange that there are two different shades of this color. They don’t really look alike either. The greener version would be great for St. Patricks Day! What fun colors! I love the green! I love OPI polish! Thanks for the information. I don’t know if I could pull of that color! But, it looks really fun! Very fresh for spring. That color is beautiful. I love OPI products. I love OPI nail polishes. My favorite is Italian Love Affair, which is a very sweet pink. 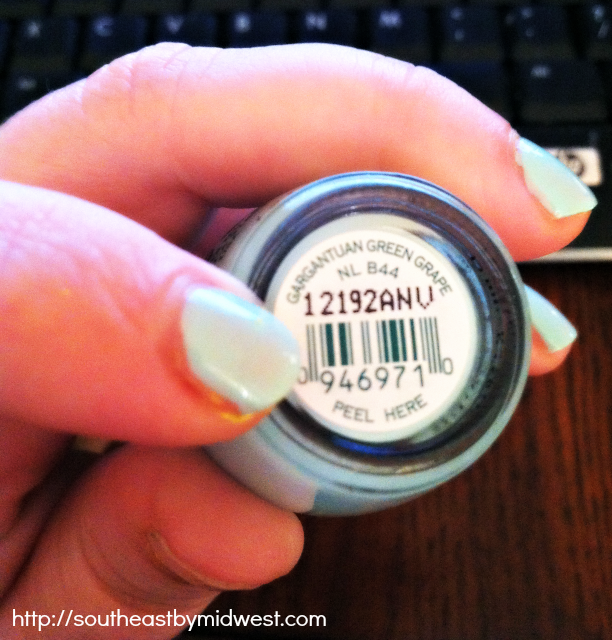 Though I love more untraditional nail polish colors for the summer time. My mother-in-law would love that color. She wears a lot of interesting colors on her nails. What a pretty color. Would be great to wear for spring. Oh, I love the colors! I need to pick some up, love how long it lasts! I love that blue! I have never used OPI before. I’ll have to try it! Both are fun colors. I would love to get into nail polish. I’m really plain jane when it comes to my nails. I love, love OPI nail polishes. I have far too many of them on my polish shelf (if I have a shelf dedicated to polish you can probably already tell I have a small addiction). Those two versions both would be great for spring. Love my OPI! My favorite color was Elephantastic, I’m not even sure if the still make it. But it was an adorable shade of pink. The green is an interesting choice for nail color. I like the fact that nail color comes in almost every color imaginable now. So weird how the color differs so much from the actual bottle! I would never have bought the green it shows in the stock photo but love how it came out on your nails!